Trained at Santiniketan in various forms of print-making, Indian artist Dipali Saha's solo exhibition opened on August 12 and goes on till August 18 at the Bengal Gallery. Dipali delights her viewers with her numerous presentations of cats, female figures, and nature in the form of fish, cows with enormous horns, which are all threatened by the effects of global warming. Along with this, Dipali has categorically shown black smoke emitting from kilns, fast speeding motorised vehicles on the streets. Man's industrial progress, at the cost of nature, disturbs Dipali--as is the case of ever so many artists of our times. “There used to be six seasons in India, in the up north; today there are only four,” laments the young artist, who is in her early 30s. She has exhibited in the US and in Europe, in cities like Berlin and Texas, along her neighbouring country Nepal. She says that by coming to Bangladesh, and by exchanging views and ideas with the artists in Dhaka, she hopes to increase her knowledge and experience in art. Dipali has been inspired by Rabindarnath Tagore's songs and poems based on the beauty of nature. The exhibition is being held to mark Tagore's 150th birth anniversary. She presents her various subjects in numerous forms of print-making. This she does along with oil based works. The greens, blues and reds that she has chosen pulsate with joie de vivre. Her lines, colours and forms delight the art-lover-- even though she tells a tale of destruction of our natural habitat. Her compositions remain eye-catching and unconventional. “Mother Earth” (etching) is a bold and beautiful work in its choice of dramatic lines of black and red. The etching titled “Cat” has been done with colours of bright orange and yellow, which blend with each stroke. The poised feline creature--obviously, an adulated household pet, looks as elegant as a painting on an Egyptian scroll or pyramid. The motifs at the background in olive green and burnt amber form geometrical patterns. The artist also experiments with video and installation. Images of leaves, waves and other intriguing plant life form the rest of the print. 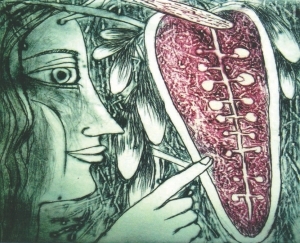 Untitled (etching) 2006 has once more a female's face and fingers pointing to some plant with pods, again done in deep pink. “Ecological agonies” has a tree ; a crescent moon, moon-dusts, and wriggling and resting snakes, crabs, fish, under-water plants -- and more birds and fleshy leaves and feathers. The work is fancy-free and spell-binding. “Mother Earth and Ecological”, oil on canvas, has a woman's form, with, bosoms, long, limbs and wild, swirling colours of green, red and yellow -- where the head should have been. Tiny florets and curling shapes complete the composition. 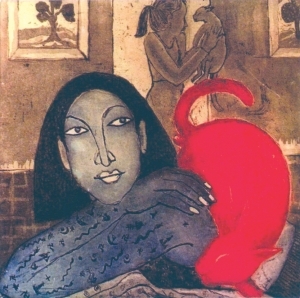 “Untitled”, an etching (2006) has a woman's form resting on a couch, holding on to a vermilion tom-cat, with its tail swirling. A woman's figure, at the back, with a pony-tail holds on to a contend cat. There are images of trees with large, bushy tops, held in yellow frames. 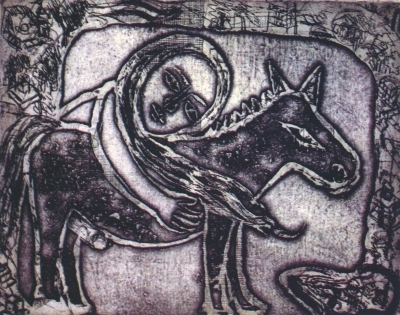 Mother Earth, etching, 40x26cm, 2008. Drawings “Untitled”, (2010) brings in more figures and faces along with houses, towers and deigns of seated animals. Again, “untitled ( 2010) has a woman with floating hair. She holds on to an outlined crescent moon in one hand and a grotesque piece of vegetable on the other. In “Cat”, a “holography” we see a delectable female form, and animals and other animate beings in all shapes and sizes, so that the mind boggles at the artist's imaginative sweep. In yet another piece, we see a female form holding on to a vermilion blossom. Along with this image we see what might be a representation of a heart, with blood pouring through. The artist hopes to experiment more with the themes of Tagore of -- which freely mix fantasy with realism--bring in a hunting phantasmagoria world and also try out new themes and objects in the video media. She is always in quest of nouveau techniques of the art world. In this Bengal Gallery exhibit, she focuses on ecological imbalance; and the progress of mankind at the cost of the environment. Her paintings seen at the exhibition are built around Tagore's poetry and his treatment of seasons. Her own perception of nature are blended with Tagore's philosophy and poetry. 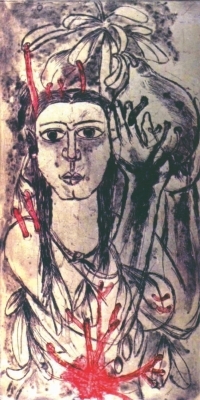 Her expressionism harks back to the Kobi Guru's treatment of animal forms in his paintings, which had won great appreciation in the capital cities of Europe, where he had exhibited.